"To Preserve and Celebrate Our Midwest Rural Heritage in the Modern World"
Group Tours and Rates are available. 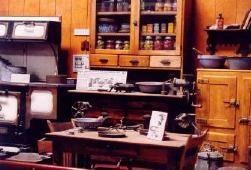 Come visit the Heritage Museums where you can step back into our agricultural heritage. We invite you to climb aboard one of the many traction steam engines, including the largest steam engine - a Case 110. Sit behind the wheel of an antique tractor or take a look at the Stationary Steam Engines featuring a Murray Corlliss engine display. 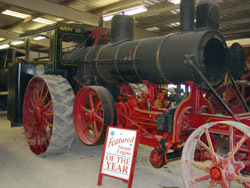 This interpretive exhibit celebrates the era when steam was king on the farms of Iowa and the Midwest. 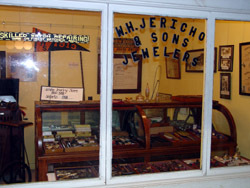 Occupying 4,000 square feet, the display includes three full-sized steam engines, a grain separator, scale model steam engines, and dozens of historic photographs showing steam engines at work. The educational section explains the components of steam engines, the dynamics of live steam and a brief history of the manufacture development of the steam traction engine in America. The final section of the display features photographic images taken by A.M. Wettach of Old Threshers Reunions in the late 1950s through the early 1970s. Take a stroll through a 1915 family farm house that depicts the home of an affluent family filled with artifacts typical of this time period. As you continue through the house you will enter the interpretive exhibit "Women: Partners on the Land". This exhibit deals with the impact of women on the economic and social unit of the "family farm". The work of farm women was, right from the start, a partnership. No value too great can be placed on her cooking, cleaning, sewing and raising children, which made rural families strong. One of the most popular exhibits, you'll be reminded how different life was for these Partners On The Land. You will come upon the Peterson Farm Implement display. This exhibit recreates a dealership much like ones that could have been found in almost any small Midwestern town in 1939. American Farm Implements The American Farm Implements exhibit shows the progression of implements that allowed the farmer to produce more with less effort. The display will conjure up many thoughts of how things were done in years past. 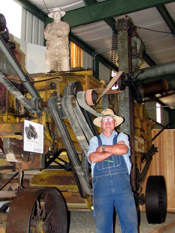 In 1994 Old Threshers obtained the Marvin Mill. Joseph Hiram Marvin owned and operated a buckwheat mill on the north side of Fayette, Iowa. Farmers drove wagon loads of corn and wheat to a protective overhang, dumping the grain through a trap door where a conveyor carried the grain to the second floor. The second floor of the mill held the corn sheller and grinding stones imported from France. Accessed by a ladder, the third story held the fanning mill and the flour sifter. The final step involved running the flour through a sifter covered with silk cloth, and packaging the buckwheat flour, graham flour, or corn meal. 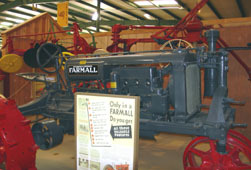 Changing Seasons conveys to the visitor the evolution of the row crop tractor from 1930 to 1960. The exhibit follows the natural progression of farming technology using International Harvester implements. 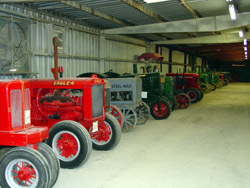 The history of International Harvester, a tractor timeline, the story of IH collectors and the restoration movement is told through photographs, text, and implement displays. 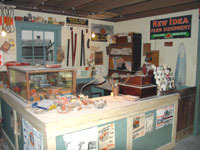 The end of the exhibit features a 1960s International Harvester dealership with related IH products as well as a parts counter. The exhibit showcases both self-generated electricity and electricity acquired for the family farm through rural electric cooperatives. The advantages for rural farm electrification brought new things to the farm like irons, washing machines, refrigerators, and vacuum cleaners. You will walk into Grandpa's Barn an exhibit entitled "A Vanishing Landmark", displaying a tack and harness area, shop, planting artifacts, and a hay fork collection. This exhibit will focus on these two basic problems that faced the turn-of-the-century farm: Water...Too Little, Too Much. When too little water existed on the land, some means of raising the water to the surface had to be employed. However, too much water rendered the land less useful for farming. This exhibit features artifacts used to acquire and hold water for use on the farm and also displays relics that were used to remove excess water, making the land usable for tillage. 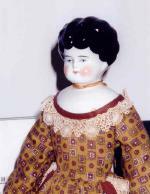 The newest exhibit in the Heritage Museum is a large antique doll collection from the Bussey Family of Granite Bay, CA. The dolls, which vary greatly in age, type, and value, are a dream come true for the Hawkeye Doll Club, who have become the care takers of the dolls for Old Threshers. See if you can find the doll you had as a child. The Printers' Hall exhibit follows an historic timeline of printing from the first time the first settlers crossed the Mississippi. 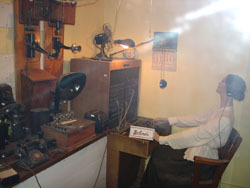 The exhibit includes a 1870s Hand Press, various kinds of platen presses, cylinder presses as well as handset type. Printer’s Hall is the home of the "Threshers Bee Newspaper", printed for the first time at the 2006 Reunion.